Such a crazy week and I'm leaving this one down to the wire. After reading a post on Well Preserved I was reminded of a great resource for finding interesting and new flavor combinations. The Flavor Bible has been on my shelf for months and I never thought of using it for coming up with flavor pairings that would work in a Jam. I had intended on making a plum jam because we had such a variety of different plums and there were more than we could eat. Flipping over to the Plum section of the book, the very first listing that jumped out at me was Bay Leaf and Vanilla. I had to try it. I love sweet and savory combinations and this one sounded like a winner, especially since we were going to use our own homemade vanilla extract (Beans + Vodka + Time = tasty goodness). I have to say that I loved how this turned out. It's very sweet but the bay just gives it hint of something herbal and it really works. I think if I would change anything next time I would lessen the sugar and add a few extra bay leaves. 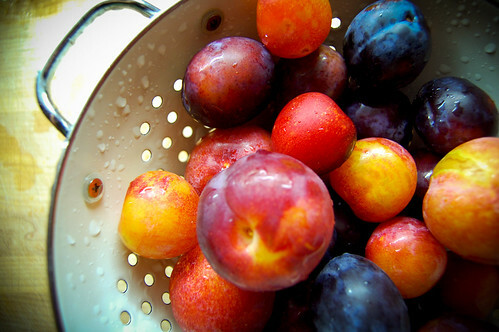 1 - Combine plums, sugar, lemon juice, salt, vanilla and bay leaves in a pot over high heat. Bring to a boil, mashing with a potato masher and skim off any scum from the top. 2 - Boil and stir frequently, until the bubbles slow down. Place some small plates in the freezer and use them to test if your jam has set. 3 - Prepare jars and lids, ladle jam into hot jars leaving 1/2 inch of head space and remove any air bubbles. Hot water process jars for 10 minutes. Do you think you could use apricots instead of Plums?